Chances are you’ll be entertaining friends and family for the holidays. Here are some quick tips for comfortable small-space entertaining without sacrificing your growing guest list. Corral all of your stools. From seating to a makeshift side table, stools are great for meeting the various needs when it comes to small-space entertaining this holiday season. Stool ideas can include ceramic garden stools you might have outside or even ottomans that can double as seating or storage. Try nesting tables and other table tricks. Nesting tables are small tables that can be easily stowed away, folded or stacked to take up less space in your home, yet maximize the space in your home when needed. As guests trail in and begin sitting at the aforementioned stools, for instance, it’s nice to be able to retrieve one of your smaller nesting tables and place where needed. If you don’t want to crowd the space by adding extra folding tables, you can use tiered platters to optimize your table space to include more food instead of using an additional folding table. Whether you have free standing book shelves or built-in shelving, these are perfect when it comes to small-space entertaining. On a typical day, your shelves hold your family photos, books and knick-knacks, but when entertaining, it’s time to clear the shelves for their new role. 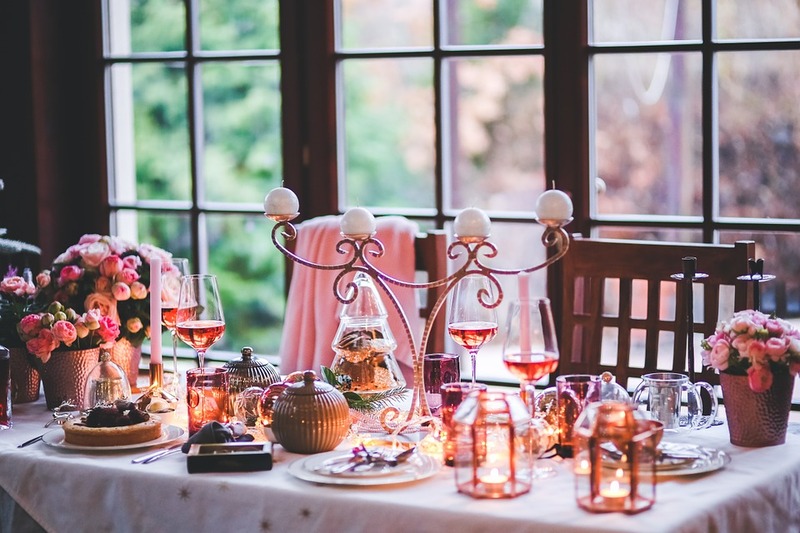 Swap out your personal items for small entertaining necessities such as plates, napkins or cutlery. You can even turn it into a sort of makeshift bar by placing your liquor bottles, mixers, cocktail tools and glassware for easy self-serving. Get crafty with your cart. Speaking of self-serving, carts make this especially helpful when entertaining in your small space. Instead of crowding the food table with drinks (and holding up the food line), a cart is the perfect place to store your cocktail and wine accessories. This is another great space where you can place your plates, cutlery and napkins. Anyone knows that small-space entertaining means you’ve got to get creative with what you already have. For instance, you could clear out your table lamps or floor lamps and hang string lights overhead to not only create a fun ambiance, but also to optimize your entertaining space. Another great way to work with your resources is to push all of your chairs to the outskirts of the room so that there is more standing space for your guests. Plus, this makes the room appear larger. It’s a win-win for everyone.